Do you want to make money online via affiliate marketing? If yes, see those things you will need to start. There are many things you need to keep in place that I will explain in this lesson. Like I always explained, affiliate marketing is one of the best ways to make money online. In affiliate marketing, you are paid a sales commission whenever you refer someone to buy an affiliate product or services that was promoted by you. For me, it’s my second most effect way to make money online. It;s quit easy. 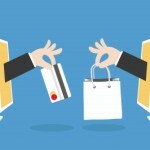 In affiliate marketing, you don’t involve in the sales process or delivery. You only point hand on a certain product or service. Once someone buys from your link, you are paid a commission. Like, I explained in the previous lesson, the amount of money you can make from affiliate marketing depends on the price of the product you are promoting, the commission rate, the buying rate and the return policy. 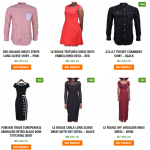 See for instance you promote a fashion product on konga, You will be paid 9% of the amount on every purchase from your link. (1) Bank Account: You need a bank account here in Nigeria. The best bank to use for online payments are Diamond Bank Savings Extra. With Diamond Bank Savings Extra, you can receive money from anywhere in the world. 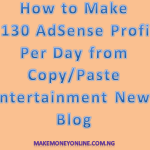 This is the account I am using to receive my AdSense Earnings. Another option is GTbank Domiciliary Account. With this account, you will be paid in dollars here in Nigeria. You will then have options to change the dollars into Naira for local purchase. 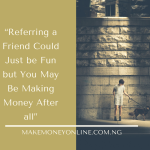 (2) Payoneer Account: A Payoneer is a US Based bank account that you will be using to receive affiliate payment if you are promoting products or services that are not in Nigeria. Example, if you are promoting a product from US or UK, you will be paid through Payoneer Account. Many Nigerians, including me, make lots of money by promoting products outside Nigeria. This is even better because they pay in dollars and the amount is very high when you convert it to Naira. With Payoneer, you can receive payments from Amazon, Infolinks, Commission Junction and many others retails shops who accepts Nigerians. Yes, you simply use Payoneer to receive payments from US and European companies – as if you have a USD or EUR bank account! You can even make money from Payoneer even if you are a new member. Once, you receive upto $100 in your account, they will sama you with free $25. Just like that. Click here to register for Payoneer Account. (3) A Niche blog: You need a niche. 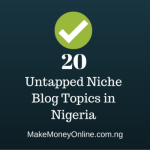 A niche blog is a blog that is taking about a single topic. 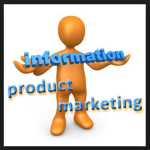 You can pickup a particular niche blog topic that have product or services and write on it. 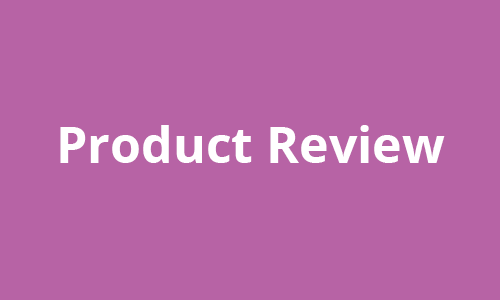 Let’s say you want to talk about lifestyle products, there are many lifestyle products you can promote at amazon, konga, Jumia or other online shops to make money. Read how to create a blog here. (4) E-mail Marketing Software: You will need to be communicating with your subscribers regularly. A typical example is the lesson notification that I send to by subscribers. I send emails to many subscribers at the same time. You can only achieve this with a good email marketing software. I use Campaigner email marketing software. It’s fairly cheap and it delivers excellently. (5) Knowledge: With all the above in place, you need knowledge to put them together. Not just knowledge but correct knowledge. If you are already registered to this training, you are saved because, I will continue to teach and guide you for free. If you have not registered yet, make sure your register now. I have published many lessons on affiliate marketing in the past. So, if you missed any of the lesson, kindly browse them here. Any commercial bank is okay for this. I will start up a blog soon. Thanks for your good work. Hope u do domain hosting too? I checked on your blog. The news is okay because because like reading news and gossips. But unfortunately, you will not be able to get AdSense approval on that blog because the articles and photos are not original. What you need is to develop a new blog with a custom domain, try and publish at least 30 original articles, then apply for AdSense. Once approved, you can them implement the ads on the news blog. Also, the news articles in targeted to anybody,but you can still display Konga and jumia affiliate banners on it. You can make some bucks if you have enough traffic. Please how do I change get a domain for my blog ?